The Ltd. Ed. "Union Jack" Sheraton Outfit comes with a 1960s style vintage hard case with a gray exterior and blue interior along with a Certificate of Authenticity, a guitar user’s manual, and more. And like every Epiphone instrument, the Ltd. Ed. "Union Jack" Sheraton Outfit is guarantee by a Limited Lifetime Warranty and Gibson 365/24/7 customer service. Wherever there’s a new musical revolution, Epiphone is right where the action is. The Ltd. Ed. "Union Jack" Sheraton Outfit is a tribute to a vintage classic and one of the greatest rock and roll bands. Now it’s time to start your own revolution. 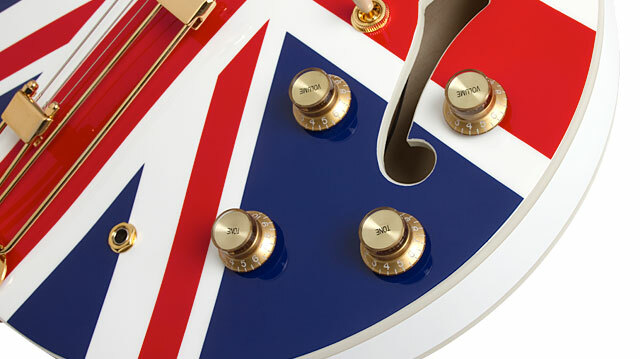 Visit your Authorized Epiphone Dealer and turn on the world with the Ltd. Ed "Union Jack" Sheraton Outfit. The modern Ltd. Ed "Union Jack" Sheraton Outfit shares all of the vintage Sheraton’s classic styling. The body and top are made of 5-layer laminated maple with Epiphone- designed “Union Jack” stripes are over a pristine Alpine White finish. The body has single layer Ivory binding on the top, back, and fingerboard and 3-layer ivory and black binding around the headstock. The 24.75” scale neck has a 12” radius fingerboard with “Block and Triangle” inlays made from Pearloid and Abalone and has 22 medium jumbo frets with a 1.68” nut. Inside the upper f- hole, Epiphone has included a vintage styled blue rectangle label with serial number and model name, just as British rockers from the 60s would have found in in their Sheraton. The Ltd. Ed. 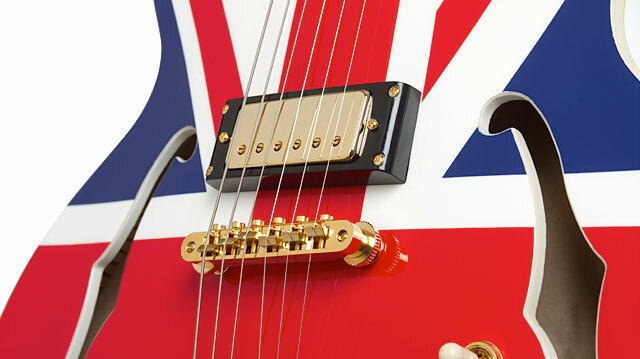 "Union Jack" Sheraton Outfit is powered by the connoisseur’s favorite pickup, the Gibson USA Mini-Humbucker. For many discerning guitarists, the mini-humbucker hits the perfect spot. Fuller than a single coil but more detailed than a humbucker, mini-humbuckers offer a player tremendous range and focus with a distinctive low end and an articulate high end that can easily overdrive for blues or stay clean for pop. The “Union Jack” Sheraton’s standard volume and tone controls are Tops Hats with metal inserts and are wired with CTS potentiometers. The Sheraton is also set off by gold hardware including the LockTone™ Tune-o-matic bridge, the ¼” Epiphone Heavy Duty non-rotating input jack, and the vintage touch of the Epiphone Frequensator™ tailpiece. The Frequensator™ can be seen on Epiphone instruments as far back as the mid 1930s and helps to give the Sheraton not only maximum sustain but also super accurate intonation. The Mahogany neck has a 1960s SlimTaper™ neck shape that is hand-set for perfect intonation. The 60s SlimTaper™ neck shape is modeled after prime vintage examples and offers a comfortable fit that makes it easy for players to move back and forth between lead and rhythm. 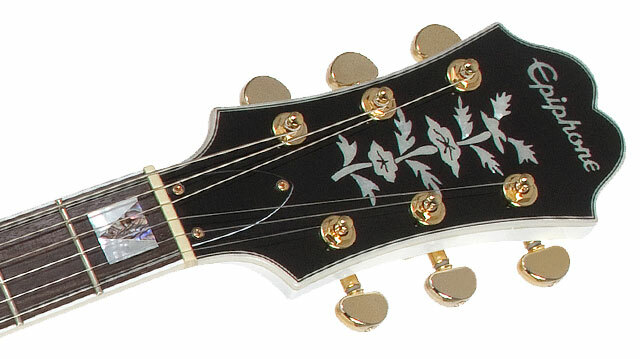 The “Union Jack’s” headstock is also inspired by the earliest Epiphone Sheratons with a Sloped Dovewing shape, a historic Epiphone “Vine” inlay in Pearloid, and the familiar “bullet” shaped black and white 2-layer truss rod cover. Machine Heads are Grover® Rotomatic with a super pro 18:1 tuning ratio.